Book News: Rand Paul To Plagiarism Accusers: 'If Dueling Were Legal In Kentucky ...' : The Two-Way Also: Claire Messud on Albert Camus' stance on Algerian independence; a twist on Pottery Barn catalog descriptions; the best books coming out this week. 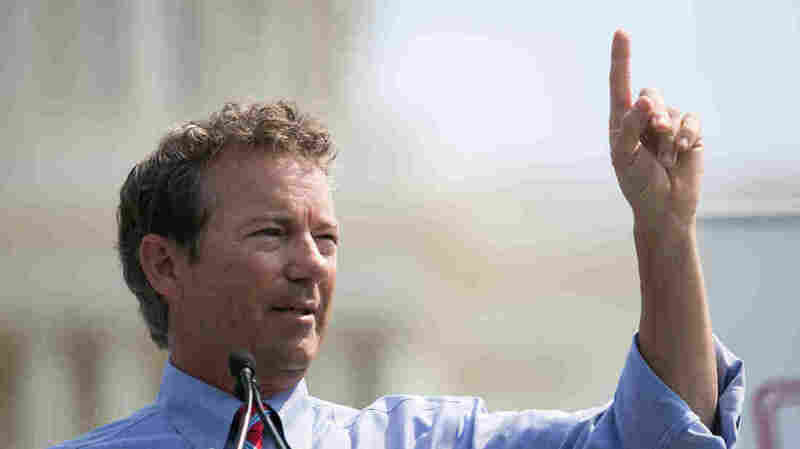 Sen. Rand Paul (R-KY) speaks during a rally on Sept. 10 in Washington, D.C. Following allegations that he borrowed passages from Wikipedia, Kentucky Republican Sen. Rand Paul is now accused of lifting passages from the Heritage Foundation without proper attribution in his book Government Bullies. BuzzFeed's Andrew Kaczynski writes, "Paul included a link to the Heritage case study in the book's footnotes, though he made no effort to indicate that not just the source, but the words themselves, had been taken from Heritage." Doug Stafford, who co-wrote the book, responded, saying that "the end notes clearly define the sourcing for the book. In no case has the Senator used information without attribution." On Sunday, Paul responded to the Wikipedia accusations: "I take it as an insult, and I will not lie down and say people can call me dishonest, misleading or misrepresenting." He added, "If dueling were legal in Kentucky, if they keep it up, it'd be a duel challenge." Meanwhile, The New York Times helpfully explains Kentucky's fraught history of duels: "In the 1800s, so many Kentuckians were killing one another in duels that the Legislature saw fit to require that incoming state officeholders swear an oath that they had not fought in a duel, issued a challenge for a duel or assisted at a duel, 'so help me God.' "
Kate Hahn imagines "Pottery Barn Catalogue Descriptions Written by an Aspiring Crime Novelist" for McSweeney's: "The door to the Farmhouse Armoire stands slightly ajar, revealing room for a 60-inch television and something more sinister... The solid pine doors can withstand the pounding fists of a captive lunatic, but not ammonia-based cleansers." For The New York Review of Books, Claire Messud defends Albert Camus' infamous stance on Algerian independence: "To witness the progression of his responses is to recognize above all the remarkable consistency of Camus's moral conviction, the dogged optimism of his outlook, and his unfailing ability, even in the complex turmoil of emotional involvement with the issue, to cleave to his own principles of justice." Also worth reading is Joshua Hammer's article in last month's Smithsonian Magazine that asks why "despite Camus' monumental achievements and deep attachment to his native land, Algeria has never reciprocated [his] love." Joe Sacco's The Great War is a wordless, 24-foot panoramic illustration of a scene from the Battle of the Somme during World War I. A work of both history and art, it shows the scope and sweep of the battle in beautiful detail. Sacco told the Los Angeles Times, "What I wanted to portray was a very large army with one objective: moving forward and dying together."